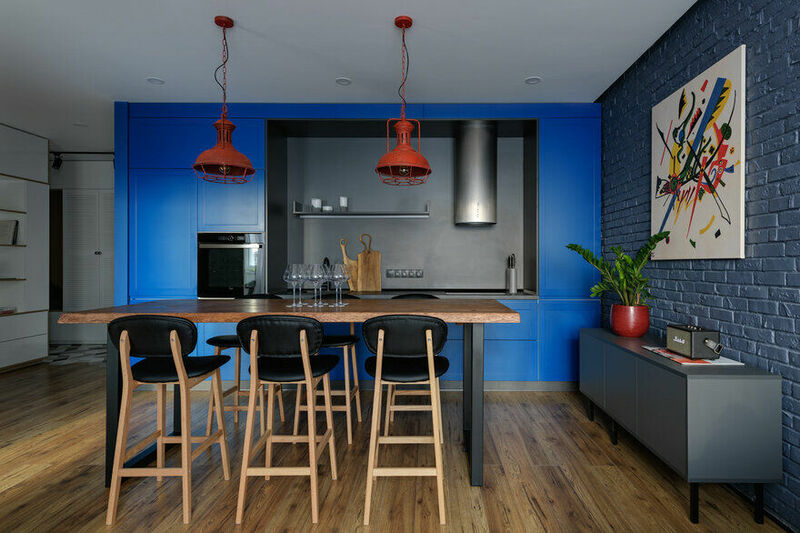 Description by designer: Zooi interior specialists have created a modern and functional interior of an apartment owned by a young couple. 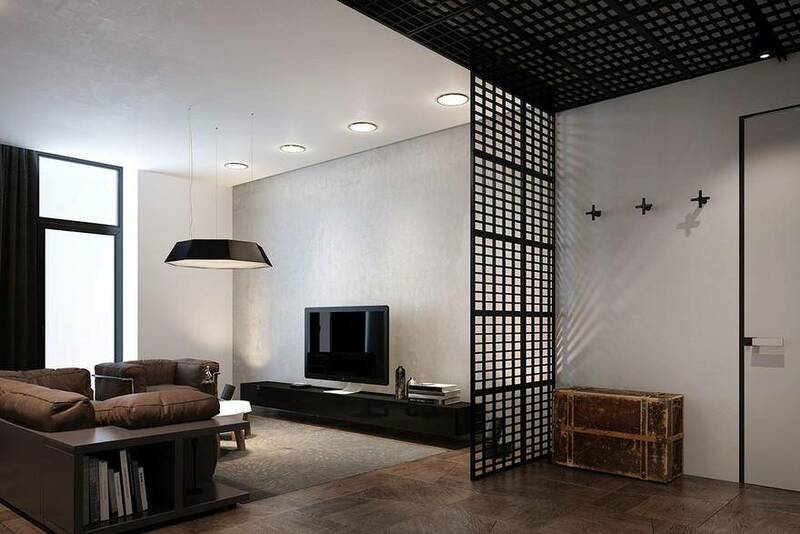 An interior conceived by the designers as equally comfortable for men and woman. 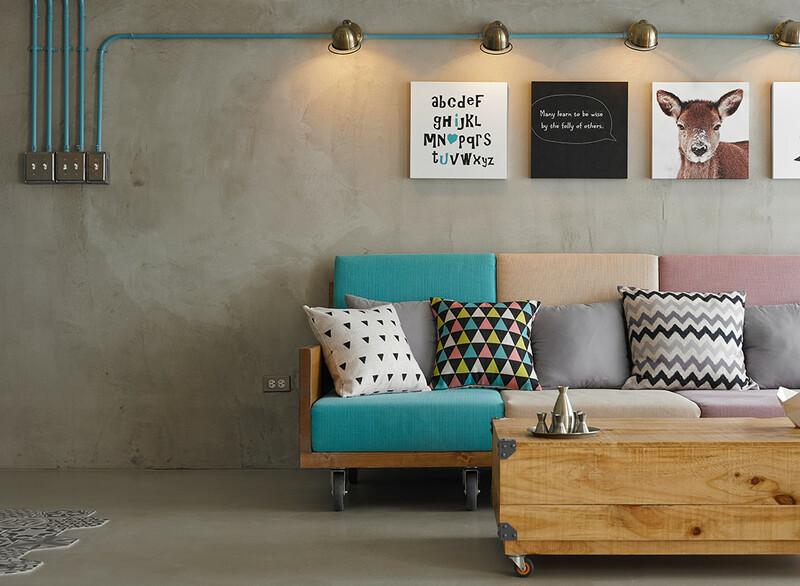 A combination of different textures and unusual colors with the predominance of a minimalistic style. 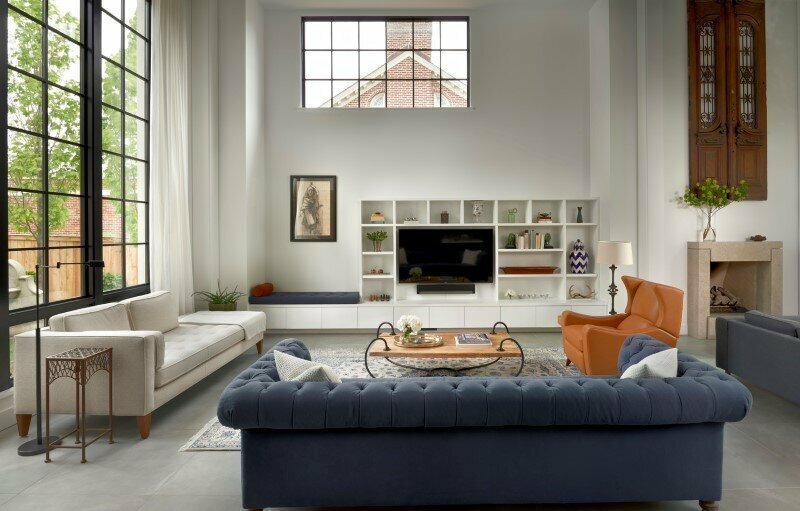 Almost all interior items such as the kitchen unit, bed, wardrobes and the suspended table have been selected from Lago factory collections. 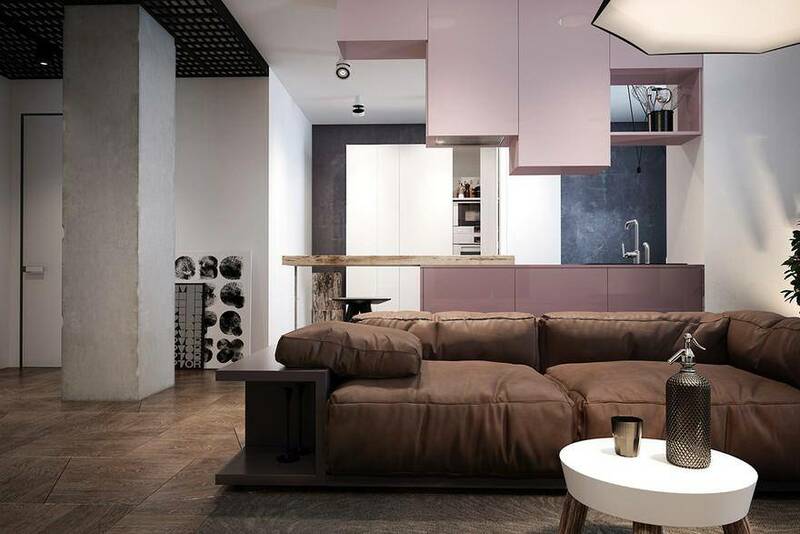 A large open space includes a bright pink kitchen and a cozy living room, composed by a refined leather brown sofa. 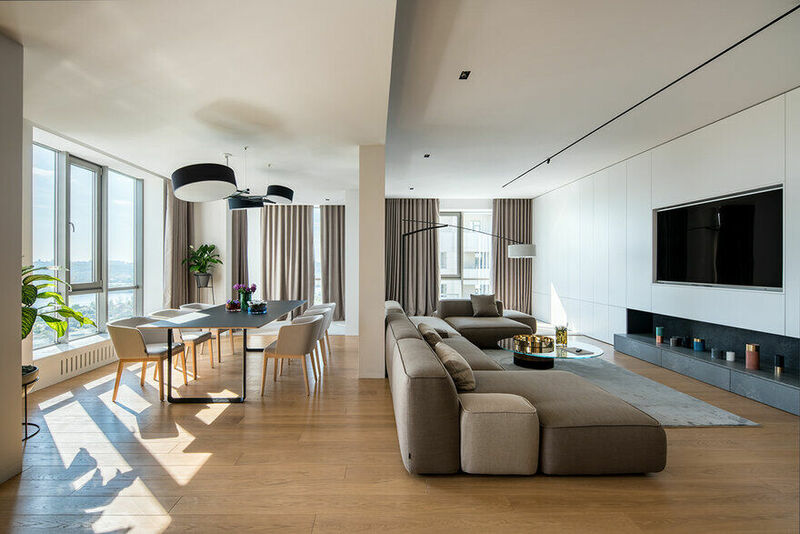 A detail of the cozy open space that hosts a delicate and elegant minimal style thanks to decorations and lights of various forms that feed the living room interior. 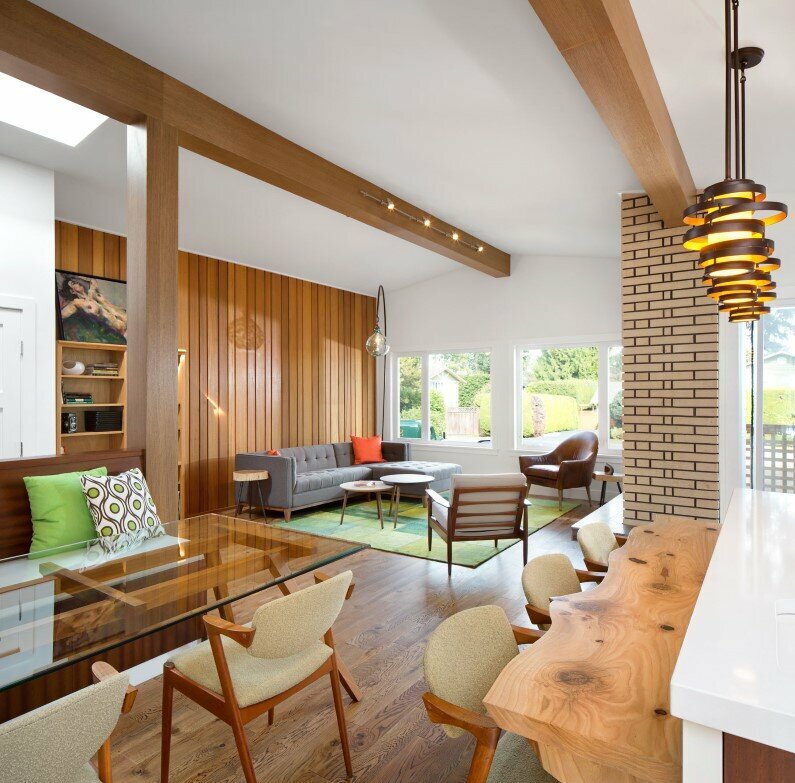 The living room and the hallway interior are separated by a moving panel. Ceiling and armature rack decorations are keeping the metal theme. 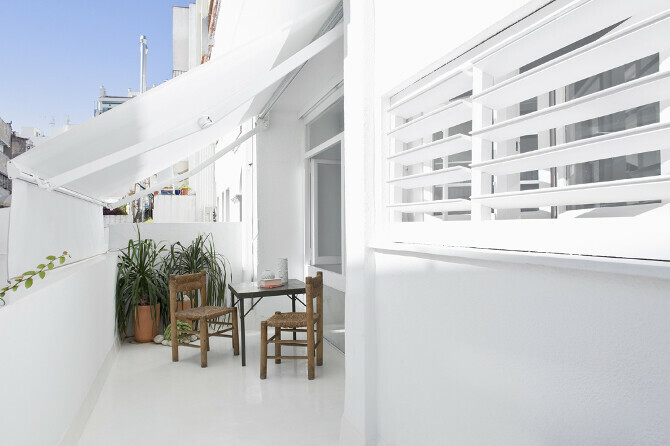 The dining area is spacious and shiny thanks to the combination of the sunlight with the bright kitchen furniture. 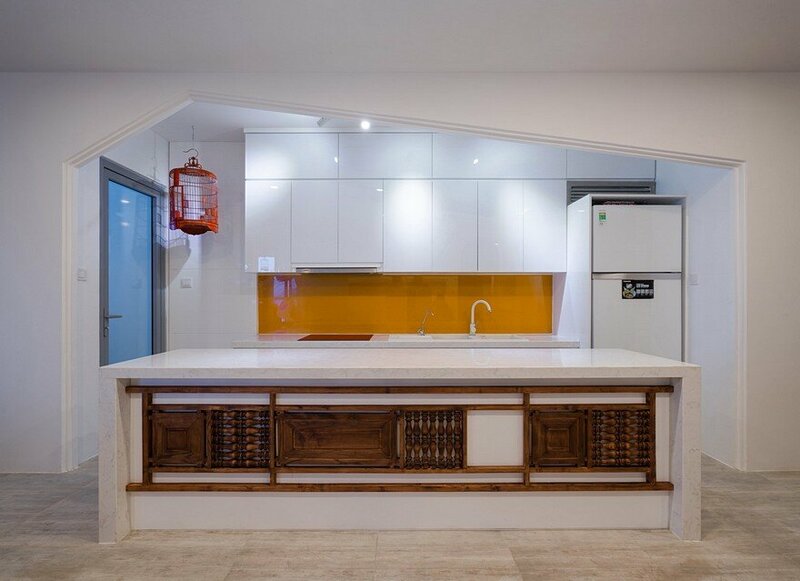 The kitchen interior and its suspended modules, individually projected by interior designers Zooi for this interior. A detail of the metal ceiling decoration with attached lighting system. 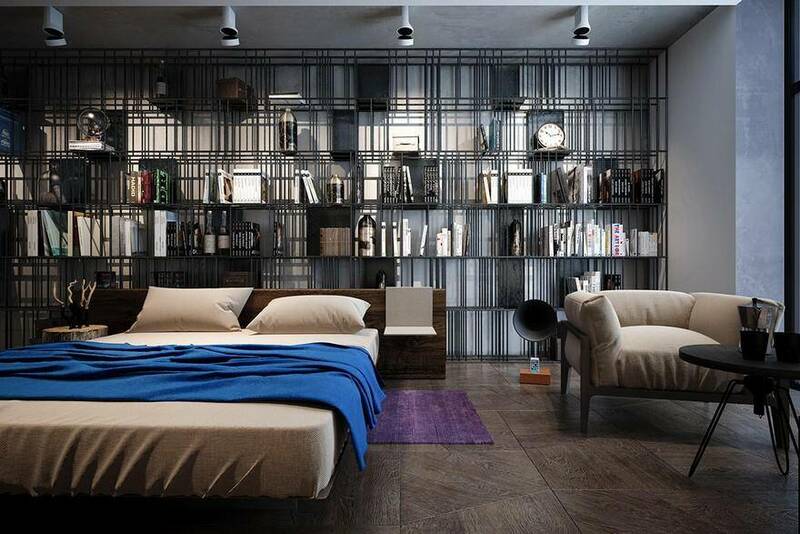 The bed is detached from the wall and thanks to the glass columns it seems suspended in the air. The floor is covered with a refined parquet in perfect harmony with the bedside table and the particular lamp, both recalling the shape of the shrubs. 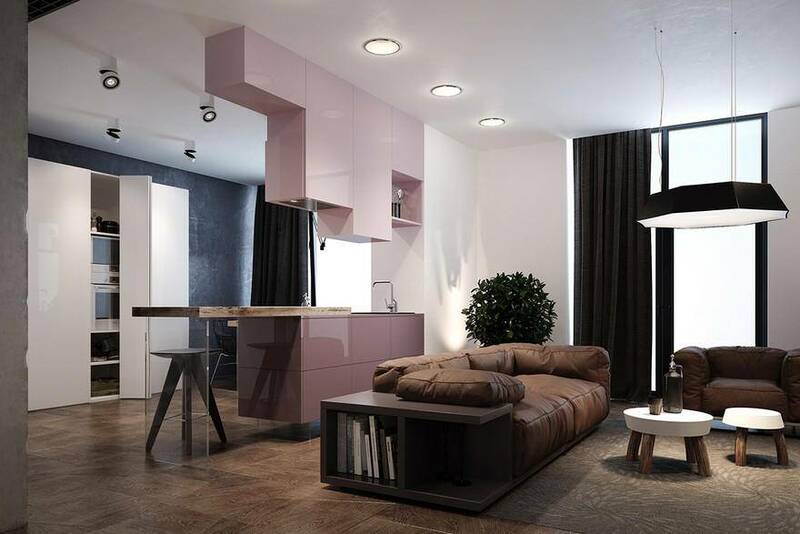 – Original bedroom interior for young couple from interior designers Zooi studio. 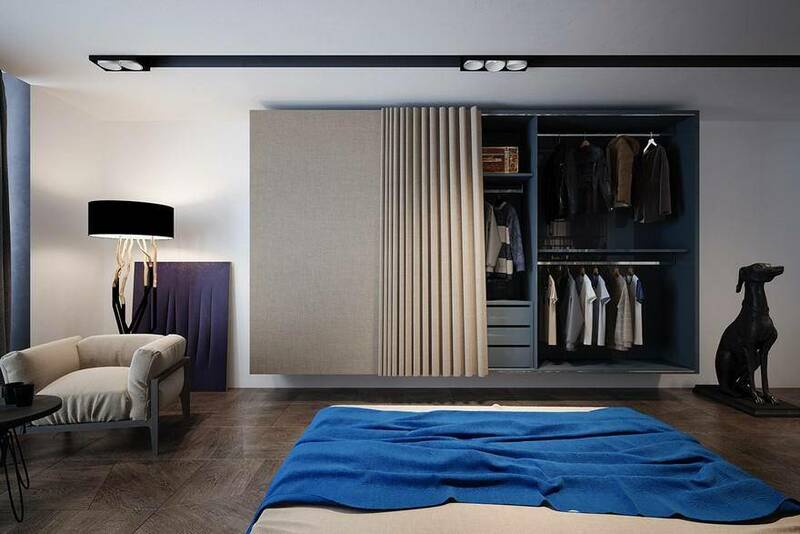 The wardrobe is also suspended in the air and when closed it becomes a screen. 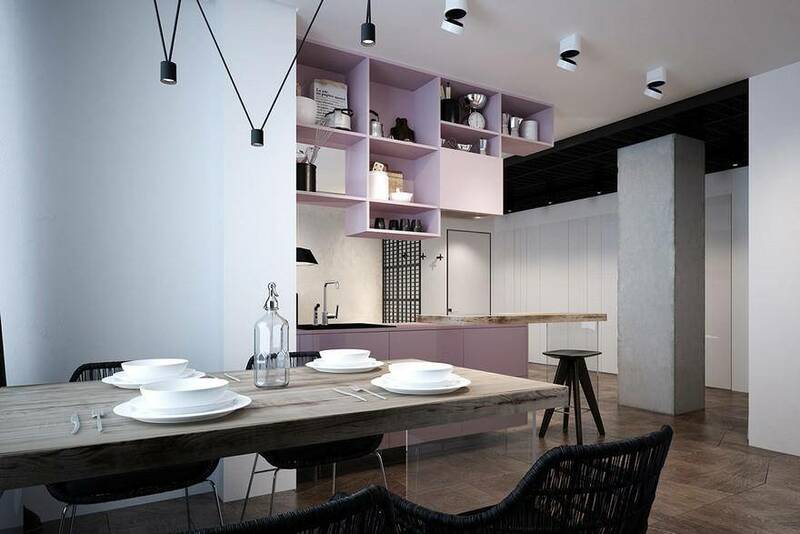 The wardrobe was ordered by interior designers Zooi studio from italian factory Lago. 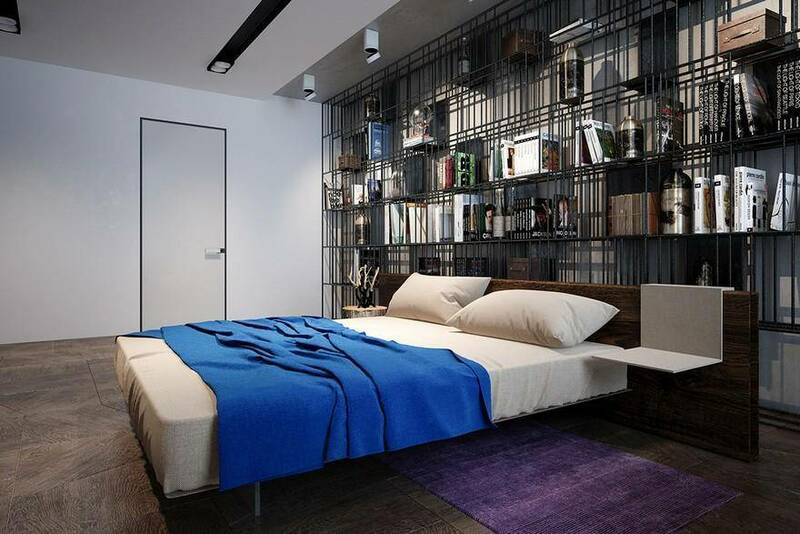 Choosing to put the bed in the center room favored the design of a comfortable and spacious home library behind it. 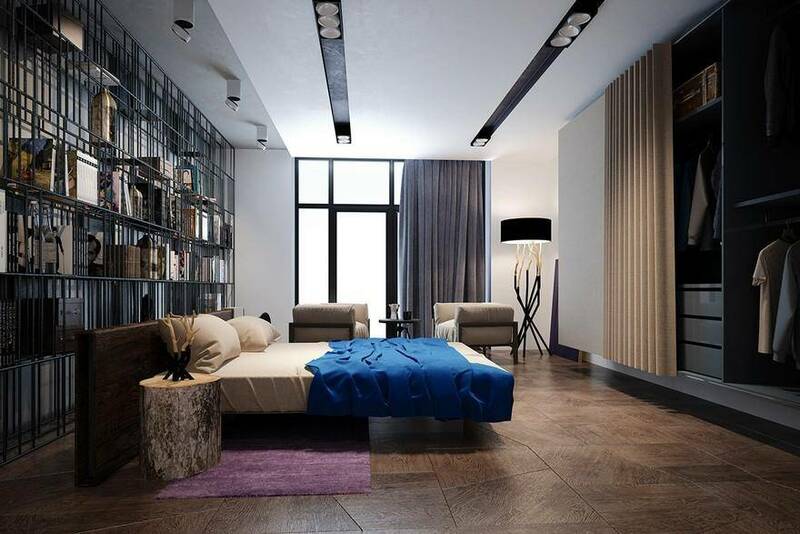 This method made bedroom interior in minimalism style larger and more comfortable. The bedroom interior and its minimalist soul, in furnishing and in the priority given to the spaces and the freedom of movement. 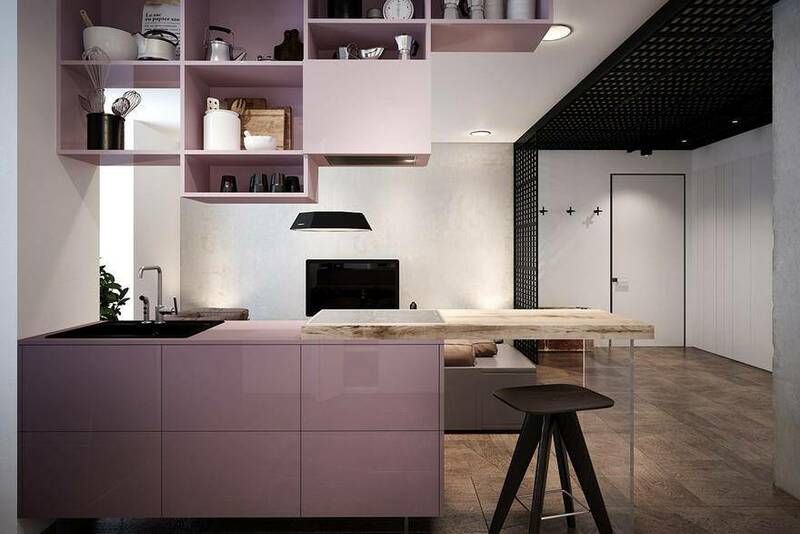 – Right decision from interior studio Zooi for Pink apartment. The barrel-shaped washbasin is the peculiarity of the bathroom interior, and has been chosen from a selection of the Italian company Agape. 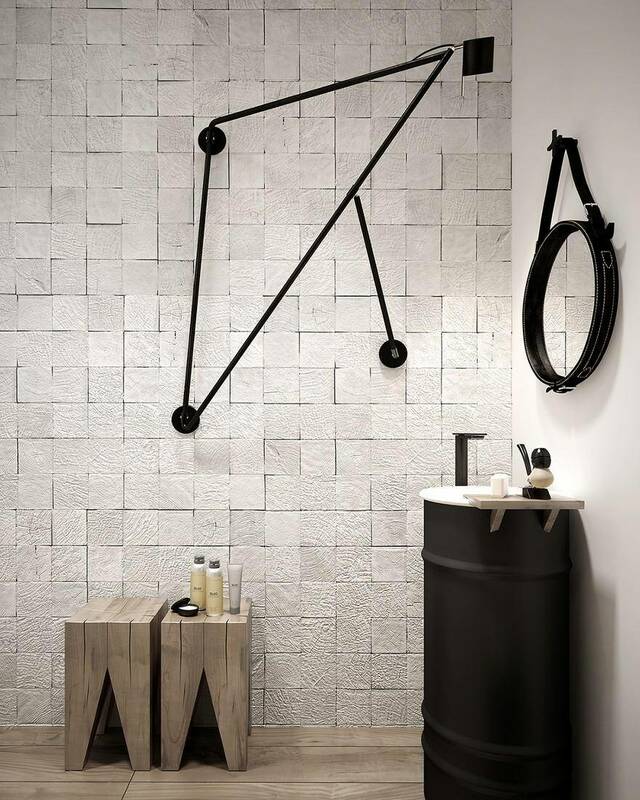 The stylish and light bathroom interior from designers Zooi studio. The wooden shower box and the heated towel rail. 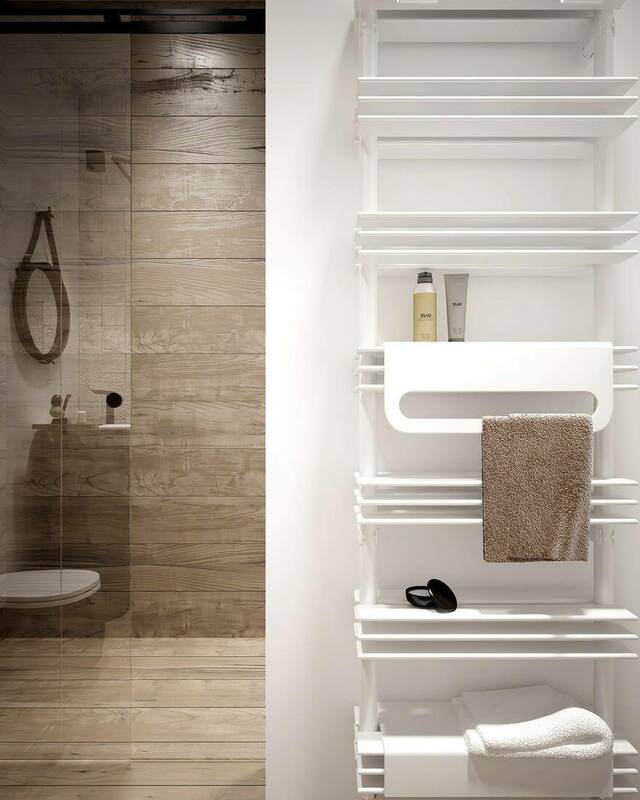 – Easy and modern decisions for bathroom interior in minimal style. 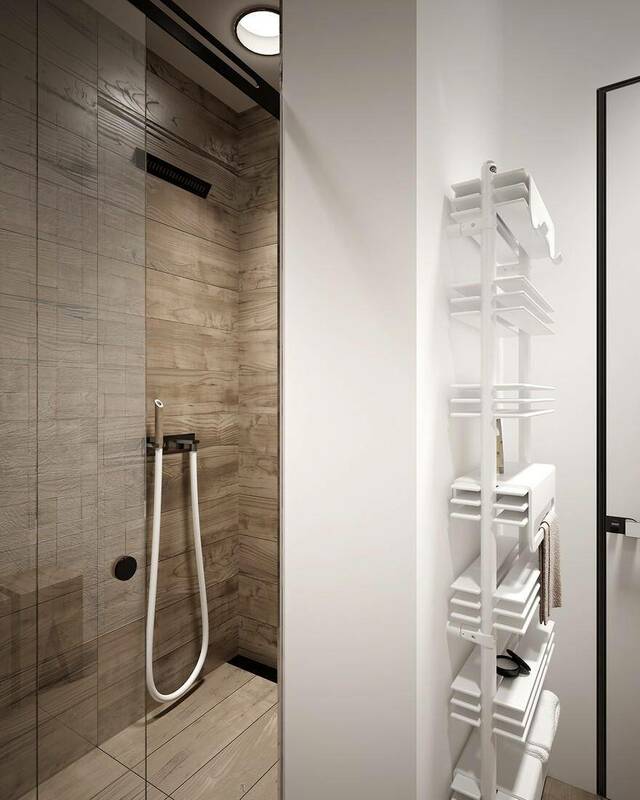 The shower set is also minimalistic and functional, able to meet every need. 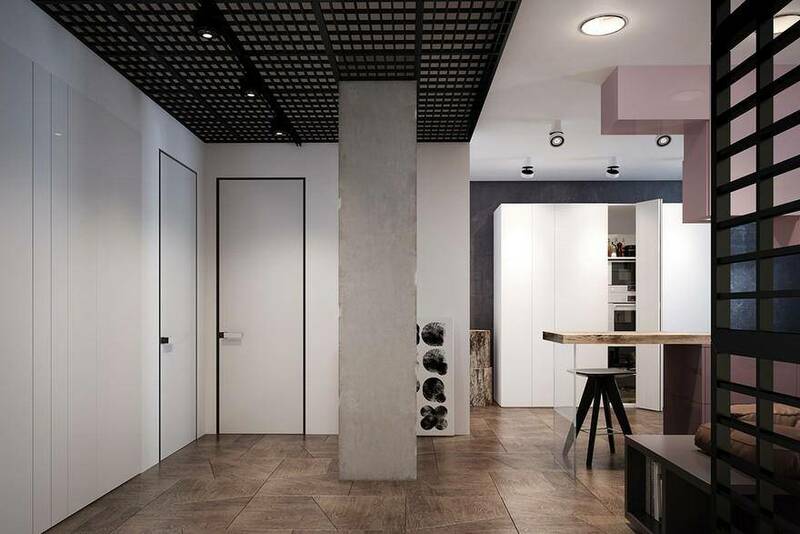 – Right decision for interior of small bathroom.